Paderborn, March 14, 2011: With a major performance boost in Version 3.0 of SystemDesk, the architecture software, dSPACE has optimized its AUTOSAR modeling and simulation environment for use in production projects. SystemDesk's enhanced performance makes it ideal for large-scale projects. Its simplified user handling and reworked modeling workflow support users working on complex AUTOSAR developments. To give users the benefits of AUTOSAR throughout the entire development process, the interaction between SystemDesk and TargetLink has been strengthened. The two tools can now exchange bundles of AUTOSAR files belonging to a software component, including supplementary documentation. The leads to greater transparency, and AUTOSAR round trips can be made with a minimum of user actions. The sooner errors are found in the development process, the easier and cheaper it is to correct them. 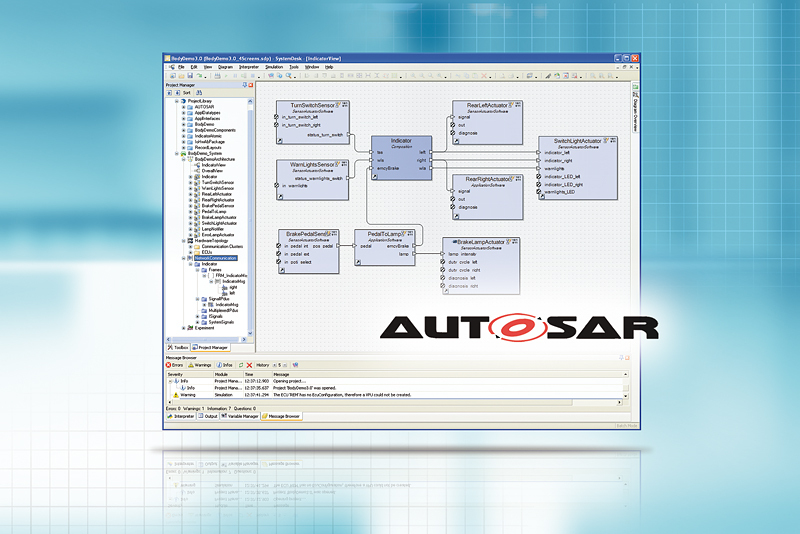 So in addition to supporting software-in-the-loop simulation, SystemDesk 3.0 lets developers execute AUTOSAR applications as virtual ECUs on an evaluation board. This means that they can simulate ECU code on the target processor at a very early stage.